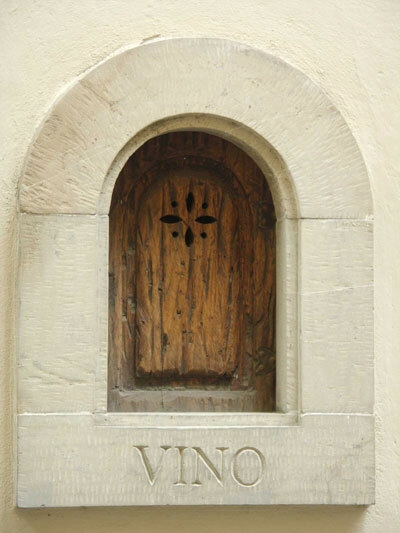 Ten years ago, a post on Tuscan Traveler celebrated the “wine portals” of Florence, known in Italian as buchette del vino or “wine holes.” On December 13, 2017, official recognition is being given to these ancient architectural artifacts with the placement of a plaque at the buchetta del vino of the Palazzo Antinori. The noblest families of Florence, having a palazzo, in the center of Florence would also have agricultural property outside of the city walls or further out in the countryside. These Florentinepalaces would store their foodstuffs, including wine and oil, in the basement or cantina. 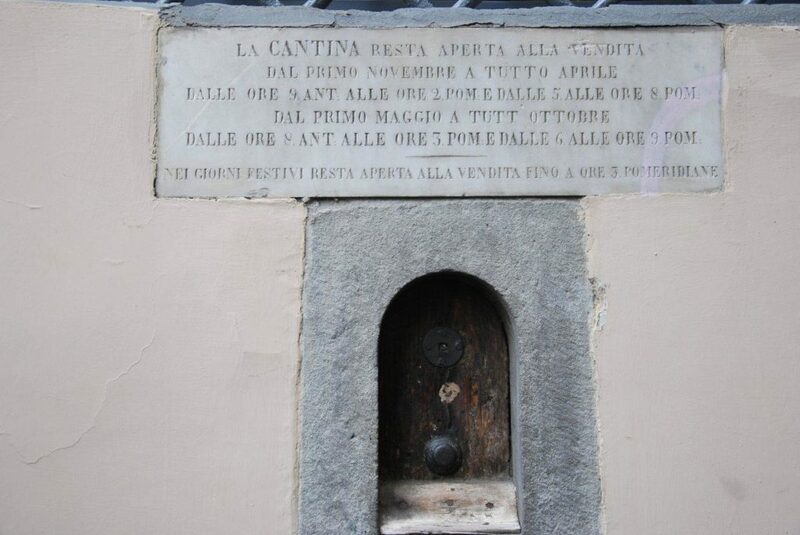 To facilitate the sale of wine tiny doors allowed access to the cantina without disturbing the palazzo residents. From the 15th century, until about 100 years ago, the wine holes allowed direct sale to the public; the transaction happened right on the street, through one of these portals. In 2015, an association dedicated solely to buchette del vino – Associazione ‘Buchette del Vino’ – was started. It’s president Matteo Faglia reports that the association has documented 167 wine holes in Florence (they are protected from removal by the city’s agency for the preservation of historical arts and architecture). Not all are in pristine condition, but the Association has documented them in a fascinating photo gallery (with addresses) on its website. Fewer portals have been saved throughout Tuscany (about 70 in 28 locations). Next time you are in Florence, try to locate at least those deemed the favorites by Tuscan Traveler, especially the one at Palazzo Antinori and the other in Palazzo Viviani. In stories of medieval knights and castles it is not uncommon to read of defenders throwing large stones and boiling oil down on invaders trying to scale the walls. Although Florence was a walled city – encircled by the last version of high walls and gates in 1333 – the ruling class worried as much about threats from within as those from outside. To defend the Florentine government from an insurrection by warring rival clans they made the Palazzo Vecchio a completely defensible structure with thick high walls, sturdy reinforced metal-studded doors, small high windows, and because they couldn’t put in a moat or a draw bridge, they added murder holes to the design of the civic palace. 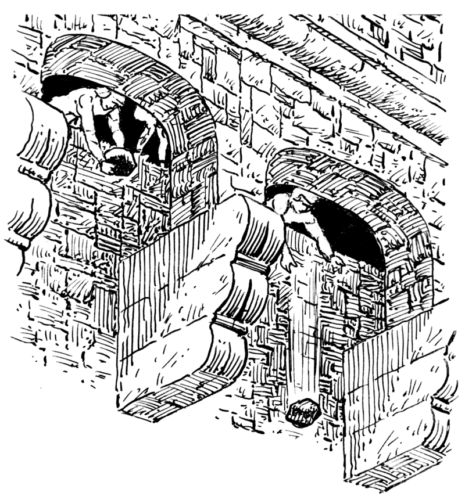 Murder holes, known as meurtrière in French and caditoia in Italian, are high large openings designed for defenders to kill attackers. Projectiles can be thrown or shot at the attackers while the defenders remain relatively safe. What a murder hole (in the floor) at the top of the Palazzo Vecchio looks like today. There two classes of defensive openings: holes in floors – murder holes – for dropping dangerous substances or shooting at attackers; and holes in walls, such as arrow loopholes, used for shooting projectiles. For arrows they are called arrow slits or arrow loops (archeres) and for guns they are called cannoniers. Defenders selected the least pleasant possible items to throw on their enemies. In the popular imagination this was invariably boiling oil, but there does not appear to be a single documented instance of oil being used; some speculate that it was too expensive. Defenders instead would throw or fire objects, such as large stones and arrows, or pour harmful material and liquids such as scalding water, hot sand, quicklime, tar, or molten lead (all of which could penetrate armor more easily than other weapons), down on attackers. The type of murder hole on the Palazzo Vecchio is the machicolation, piombatoio in Italian (a word that alludes to molten lead more than anything else). It is a floor opening between the supporting corbels of a battlement, a direct conduit to the base of the defensive walls. A murder hole in the floor across from the tapestry restoration workshop. 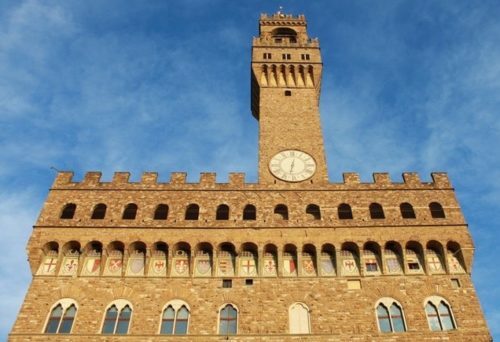 The Palazzo Vecchio murder holes may have been added to fortify the building during the short-lived rule of Gualtieri di Brienne, Duke of Athens, brought in by the city’s ruling class in 1342 to realize a medieval version of “draining the swamp”. A fresco by Orcagna (1308-1368), entitled “Expulsion of the Duke of Athens,” has one of the earliest depictions of the Palazzo Vecchio. 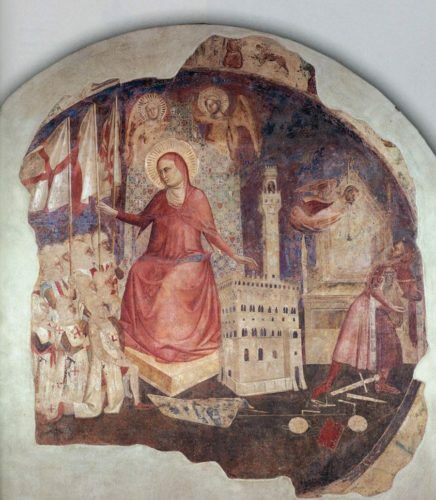 It is of St. Anne, on whose feast day in 1343 the Florentines rebelled against the tyrant. The murder holes he had incorporated into the battlements of the Palazzo Vecchio did not save him. The Expulsion of the Duke of Athens by Orcagna. 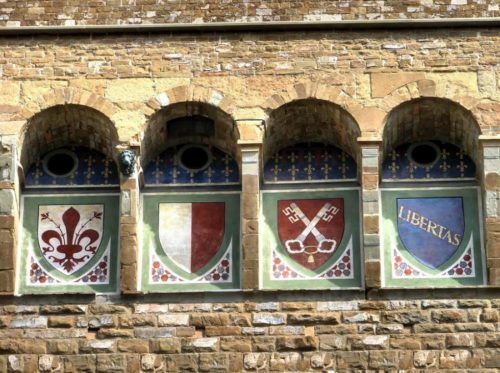 The last time the murder holes may have been used was during the Pazzi Conspiracy in 1478, when the Pazzi clan, with help from Pope Sixtus IV, sought to displace the Medici family as the de facto rulers of Florence. 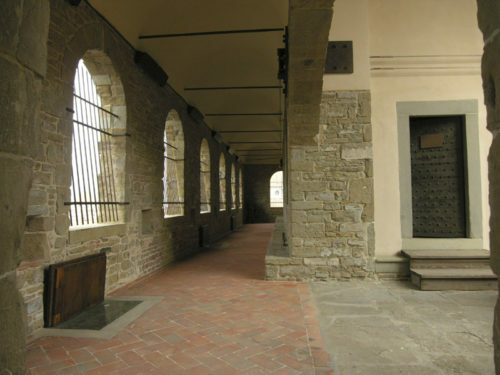 The Gonfaloniere of Justice and members of the Signoria (the titular rulers of Florence) successfully barricaded themselves in the Palazzo Vecchio to ward off in the Pazzi and their supporters. 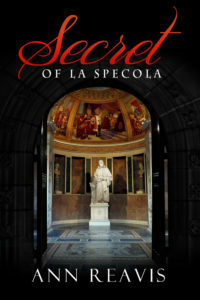 The murder holes, which still exist at the top of the Palazzo Vecchio near the tapestry restoration workshop, play a role in the second Caterina Falcone mystery by Ann Reavis, entitled Secret of La Specola. For other photos of the murder holes of the Palazzo Vecchio see here and here. Hidden away on the top of the Palazzo Vecchio is the tapestry restoration workshop of the Opificio delle Pietre Dure, the agency that oversees all manner of restoration for Florentine museums and the artistic contents of public buildings. Tapestry workshop hidden at the base of the tower of the Palazzo Vecchio. 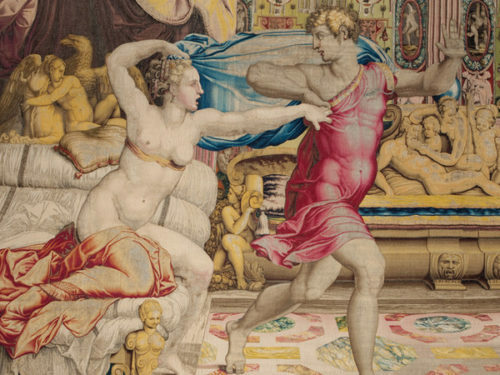 In 1985, the tapestry workshop was charged with restoration of a series of exquisite Renaissance tapestries commissioned by Cosimo de Medici in the 16th century, which were brought together for the first time in 150 years in a 2015 exhibition entitled, Prince of Dreams: The Medici’s Joseph Tapestries by Pontormo and Bronzino. In 1545, Cosimo I, the Grand Duke of Tuscany, commissioned twenty arazzi (tapestries) telling the Old Testament story (Genesis, 37-50) of Giuseppe Ebreo, or Joseph the Jew. 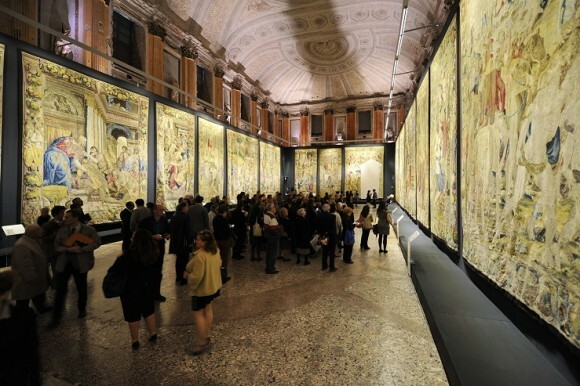 The twenty tapestries, stretching a collective 260 feet, adorned the walls of the Sala dei Duecento (Hall of the Two-Hundred) of the Palazzo Vecchio, for over 300 years. 2015 exhibit returns the twenty tapestries to their original site. In 1882, ten of them were taken to Rome to be exhibited in the Quirinal Palace, the home of the Italian Savoy kings, now the official residence of the President of the Italian Republic, where they remained until the 2015 exhibition. Why the story of Joseph? 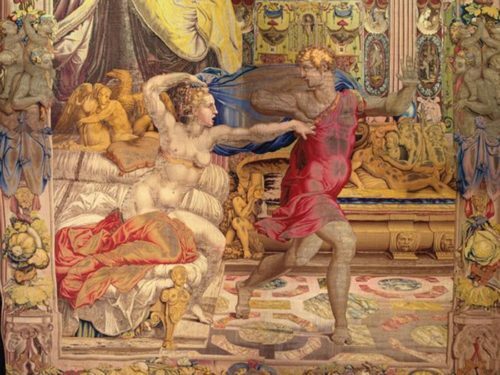 The tapestries are masterpieces of allegory, explained exhibition curator Louis Godart, whose study found in Cosimo I de’ Medici, a man who felt he had a lot in common with Joseph. Cosimo was from the “cadet” branch of the Medici family, one that lived outside Florence. He was almost unknown in the city until he came to power in 1537, following the assassination of his cousin, Duke Alessandro de’ Medici. After establishing his rule, Cosimo sought to affirm his family’s political, economic and cultural primacy in Florence and in Tuscany. He sought important foreign alliances. He married Eleonora of Toledo, the daughter of Don Pedro Álvarez de Toledo, the Spanish viceroy of Naples. He wanted to raise his profile to the level of European royalty like Charles V, the Holy Roman Emperor and King of Spain. Commissioning important works of art demonstrated both culture and wealth. Louis Godart surmises that the story of Joseph is one in which Cosimo saw many parallels to his own life. For example, Cosimo felt he and his family had been “abandoned” by Florence and its citizens, much as Joseph had been sold off and abandoned by his brothers. Cosimo came to power at 17, the same age as Joseph when he is first mentioned in the Bible. 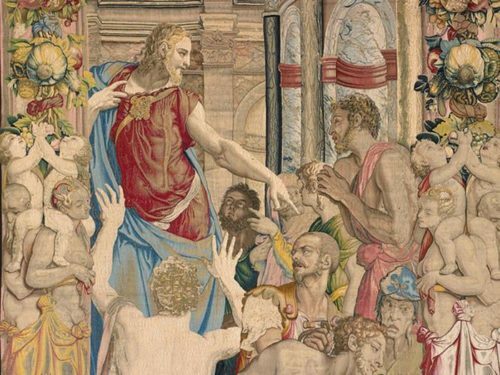 Cosimo used skill to acquire power, much as Joseph became powerful by becoming an important and trusted adviser to the Egyptian pharaoh. Cosimo also, in time, forgave many of his enemies among the Florentine nobility, in the same manner as Joseph forgave his brothers. In the 15th and 16th centuries tapestries were a common feature in European royal courts and the palaces of wealthy nobles. Cosimo sought out two of the best-known Flemish tapestry masters of his time, Jan Rost and Nicolas Karcher. They had already worked in Italy for the courts of the Gonzaga family of Mantua and the Este Dukes of Ferrara. The preparatory drawings were entrusted to Florentine painters Agnolo Bronzino, Jacopo Pontormo and Francesco Salviati. 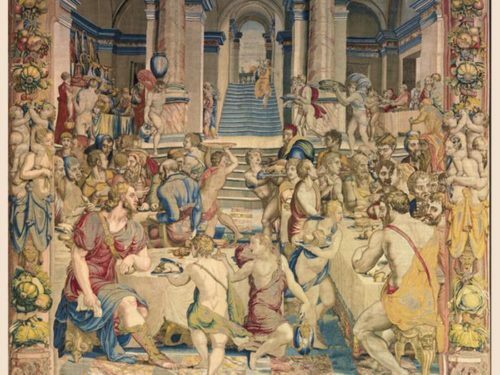 The tapestries, woven with the finest silk and gold thread, were hung in the Sala dei Duecento, the seat of the Tuscan ducal government, in 1545. There are some secrets in the tapestries. Woven into the top border of many of the wall hangings there is a ram, Cosimo’s ascendant zodiac sign, as well as a symbol of spring and new birth, an allegorical message for Florence under Cosimo’s rule. Also, in a little visual pun, Jan Rost, who soon after his arrival in Florence was nicknamed l’arrosto (the roast), signed the works with a meat skewer instead of with his name. 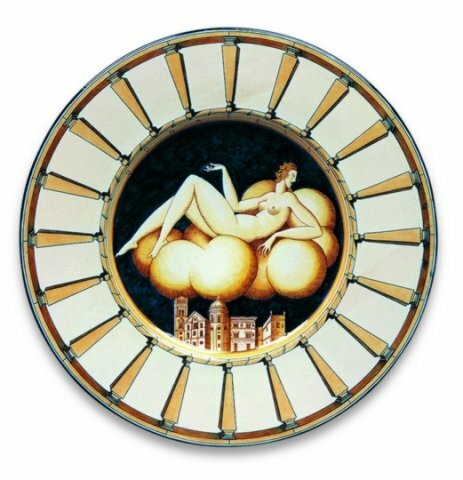 The final result of a decades-long restoration process, started in 1985, and carried out by the Opificio delle Pietre Dure in Florence and the Laboratorio Arazzi del Quirinale in Rome, was completed in 2014. 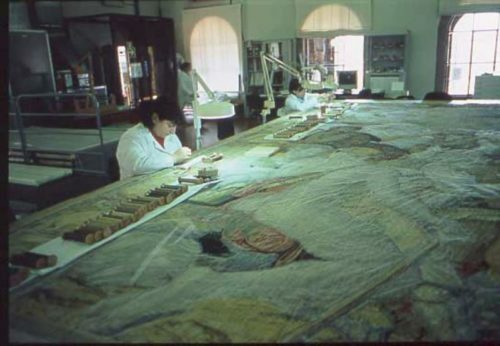 The lengthy and complicated process had to be carried out by artisans at least as skilled as the original tapestries’ makers. Godart observed, “We have the best restoration schools in the world here. 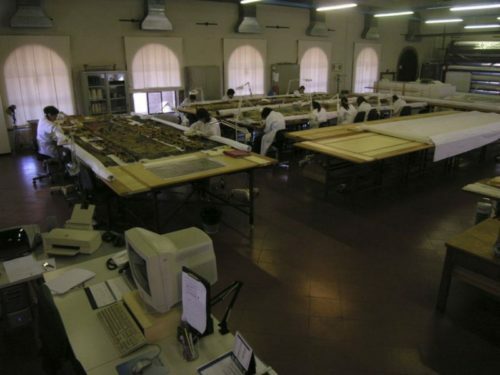 Thanks to our great know-how, we can protect our patrimony and teach others.” Italian experts have been called upon by UNESCO to intervene in areas where there are great cultural treasures at risk of war, natural disasters and wear and tear, but where the local skills to protect them are lacking. Two videos of the tapestry workshop, located at the very top of the Palazzo Vecchio, can be found here (#1) and here (#2) (narration in Italian). 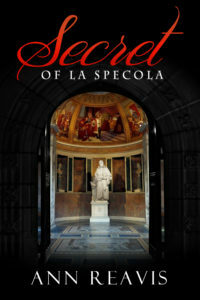 The location of the tapestry workshop plays a fictional role in the second Caterina Falcone mystery – Secret of La Specola – written by Ann Reavis. It is available at Amazon.com, Amazon.com (Kindle), Amazon.co.uk, and Amazon.it . It seems that in Italy those born in the month of September do not dream of a double chocolate cake as a birthday cake. 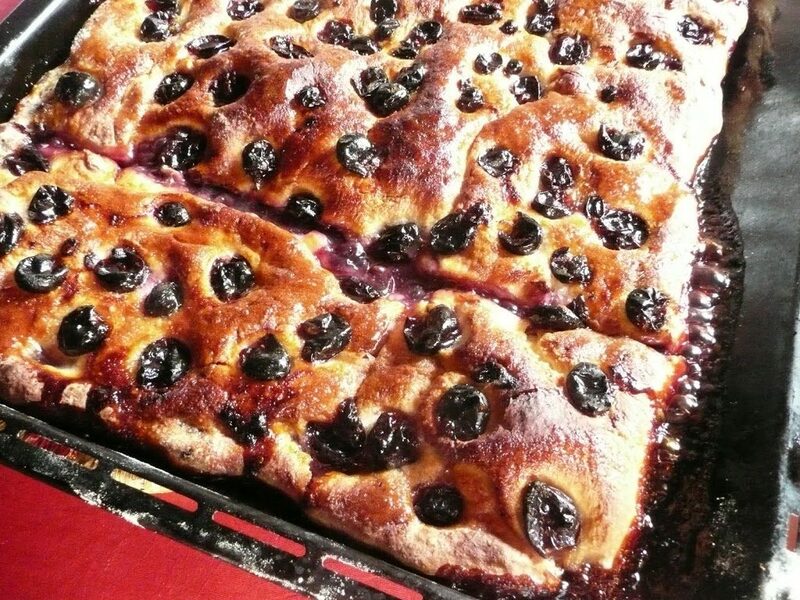 Instead they have a passion for Schiacciata con l’Uva, the traditional Tuscan sweet baked only as the grape harvest begins. Schiacciata con l’Uva (or to Florentines Schiacciata Coll’Uva) is a lightly sweetened focaccia bread spiked with the early grapes, especially those known as uva fragola or uva fragolino (strawberry grapes), which is also known in Italy as Uva Americana because it is an New World varietal – vitis labrusca – the Eastern Concord grape. The dish, however, can be made with any red wine grape (frequently canaiolo is used). Historically, workers in the vineyards of Tuscany cooked up this “poor dish” made of simple ingredients: bread dough, olive oil, sugar, a sprig of rosemary and red grapes. Some say the recipe has Etruscan origins using grapes that grew wild. Schiacciata means squashed or flattened and in Tuscany it usually refers to a salty, oily focaccia bread, but during the harvest, sugar is added to the bread dough. There are usually two layers of dough, with plenty of red grapes in the middle and on top. There are two camps of Schiacciata con l’Uva lovers: con semi and senza semi. That’s with or without grape seeds. Those who love the crunch and nuttiness of the seeds claim that it is the only proper and traditional way to eat the sweet. The Eutruscans probably didn’t remove the seeds. But the best fornos usually offer both varieties. 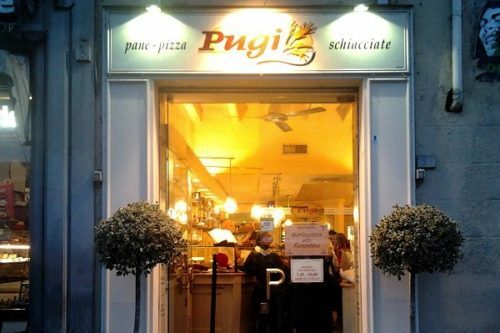 Tuscan Traveler’s favorite vendor is Focacceria Pugi in Piazza San Marco (senza semi for TT). 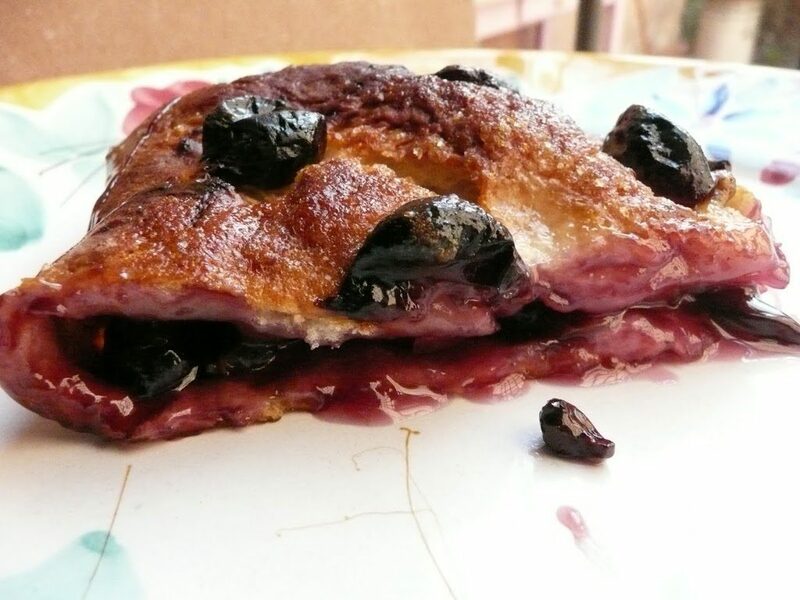 Check out the post and recipe (using rosemary-infused olive oil) from Judy Witts Francini on DivinaCucina.com (above are her wonderful photos of a perfectly made Schiacciata con l’Uva). 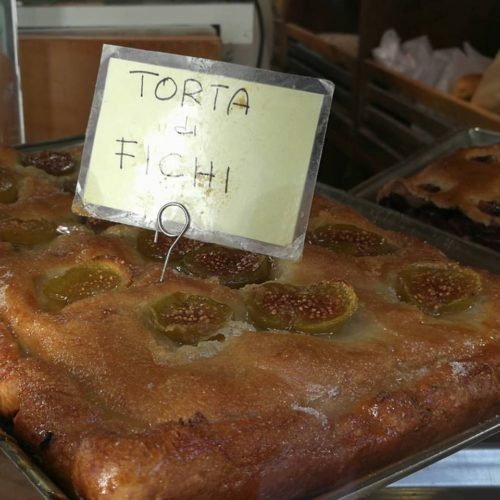 Judy also took a photo of another version of this dessert – fig schiacciata – that also makes a seasonal appearance in September. 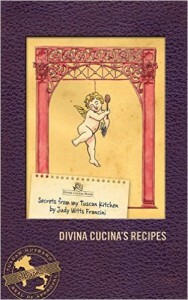 Judy includes the recipe in her cookbook: Secrets From My Tuscan Kitchen, available on Amazon.com. Other recipes and photos can be found From Emiko Davies and panevinoezucchero.it . Lisa Brancatisano of ThisTuscanLife.com presents a video demonstrating how to make Schiacciata con l’Uva. The Museum of Zoology and Natural History, best known as La Specola (because of the astronomical observatory and a weather station installed in one of the rooftop towers of the palazzo in 1790), is an eclectic natural history museum in Florence, located near to the Pitti Palace on Via Romana. It’s one of Tuscan Traveler’s favorite places to visit, not only for its lack of the crowds that are making popular Florentine museums unbearable, but for its one-of-a-kind collection mostly sourced from the 18th and 19th centuries. Much of the collection can be traced back to the Medici family and the subsequent Lorraine Grand Dukes of Tuscany. It is the oldest scientific museum of Europe. Located in the former Palazzo Torrigani, L’Imperiale e Regio Museo di Fisica e Storia Naturale (The Imperial and Royal Museum for Physics and Natural History) was founded in 1771 by Grand Duke Peter Leopold, with the aid of the abbot Felice Fontana (1730-1805), to publicly display the large collection of natural curiosities such as fossils, animals, minerals and exotic plants acquired by several generations of the Medici. At the time of its opening, and for the first years of the 19th century, it was the only scientific museum or “wunderkammer” of its kind specifically created for the public to view. It opened on February 21, 1775 to the general public. 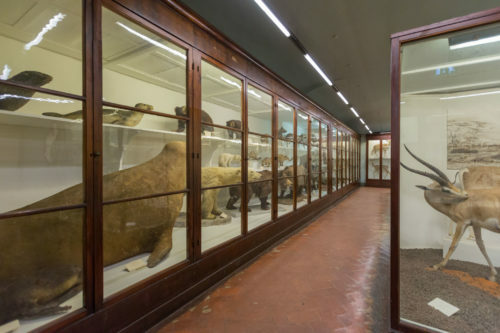 Today, the museum spans 34 rooms (24 of zoology and 10 of wax modeling) and contains thousands of zoological subjects, such as a stuffed hippopotamus (a 17th-century Medici pet that once lived in the Boboli Gardens), as well as snakes, birds, alligators and giant tortoises, and all variety of mammals from every continent. 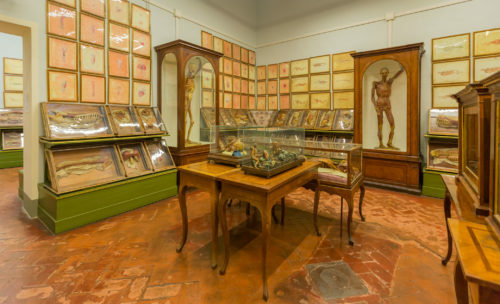 Most unusual is a collection of anatomical waxes (including those by Gaetano Giulio Zumbo and Clemente Susini (1754-1814)), a scientific art developed in Florence in the 17th century for the purpose of teaching anatomy to medical students. This collection is very famous worldwide for the incredible accuracy and realism of the details, modeled and copied from corpses. The museum also has a large collection of historical equipment for the study of physics, chemistry and astronomy equipment but much of those were distributed to other museums and institutes that occurred between 1860 and 1930. The Tribuna, on the lower floor, planned and built by the architect Giuseppe Martelli in 1841 to honor the memory of the great Tuscan scientist Galileo, is decorated with frescoes of Galileo in the Venetian court presenting his telescopes to the Doges and pietra dura decorations representing some of the principal Italian scientific achievements from the Renaissance to the late 18th century. 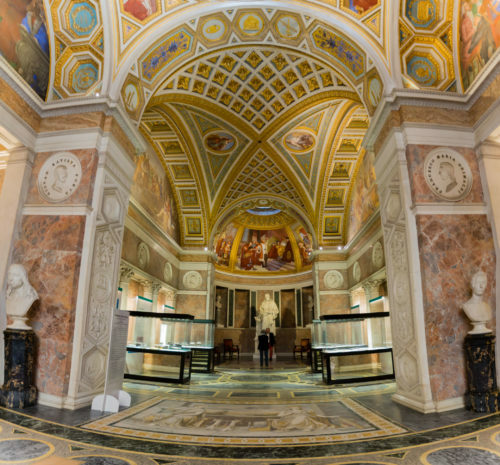 The Hall of the Skeletons (Salone degli Scheletri), inaugurated on the ground floor in March 2001 after 5 years of restoration, is only open by special request. It displays the majority of the ontological, and especially mammalian, finds owned by the Museum. This important scientific collection is consulted regularly by both Italian and foreign zoologists and paleontologists. 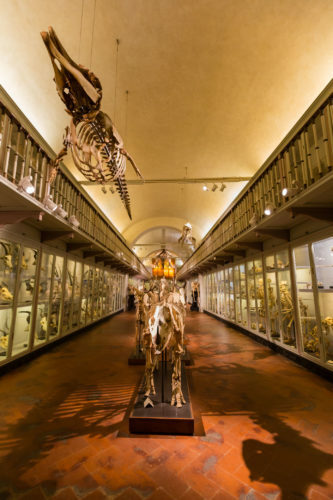 There are more than 3,000 full or partial skeletons in the hall, some very old – the elephant’s skeleton from the 1700’s, and rare, even extinct animals, such as the Sonda Rhinoceros, a Thylacine ( Tasmanian Tiger), an Echidna (an egg-laying mammal), a Platypus, and giant ant-eaters. There are also primates and human skeletons. 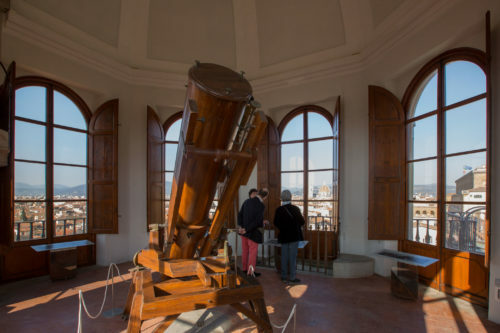 The top floor of the palazzo – and part of the museum – contains an octagonal tower room of telescopes (and great views), known as the Hall of the Storks (La Sala delle Cicogne) because of the decorative carvings supporting the vaulted ceiling. This was the Specola where Grand Duke Peter Leopold had his observatory and weather station. Giuseppe Antonio Slop de Cadenberg (1740-1808), a Trentino astronomer and teacher, designed the observatory, choosing the stork as a symbol of knowledge. The visitor who wants to get the most out of a visit to La Specola is advised to call in advance and arrange entry to the Hall of the Skeletons and the Hall of the Storks during their visit to the main museum complex. 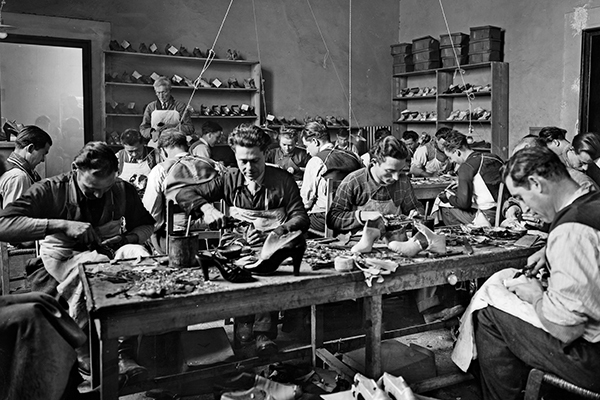 It has been 90 years since Salvatore Ferragamo left the U.S. to return to Italy to find the master craftsmen to realize his unique designs for high quality handmade shoes. His company is marking this milestone with an exhibition at the Salvatore Ferragamo Museum, called 1927 – The Return to Italy. The Ferragamo Museum is one of the most creative in the world. This exhibit, curated by Carlo Sisi and designed by Maurizio Balò, sends visitors inside the Roma, the transatlantic ocean liner sailing from the United States to Italy in the 1920s, which carried Salvatore back to Italy. 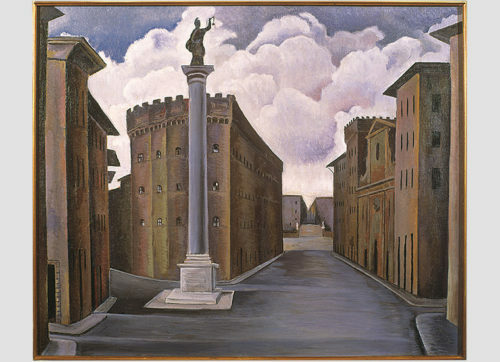 The exhibition seeks to convey the artistic and manufacturing atmosphere of Florence in 1927. Salvatore Ferragamo was born in 1898 in Bonito, near Naples, the eleventh of 14 children. After making his first pair of shoes at age nine, for his sisters to wear on their confirmation, young Salvatore decided that he had found his calling. He always had a passion for shoes. After studying shoemaking in Naples for a year, Ferragamo opened a small store based in his parent’s home. In 1914, at age 16, he emigrated to Boston (in the belly of a much rougher ship than the Roma), where one of his brothers worked in a shoe factory. After a brief stint at the factory, Ferragamo convinced his brothers to move to California, first Santa Barbara then Hollywood. It was here that Ferragamo found success, initially opening a shop for repair and made-to-measure shoes, which soon became prized items among celebrities of the day, leading to a long period of designing footwear for the cinema. However, his thriving reputation as ‘Shoemaker to the Stars‘ only partially satisfied him. He could not fathom why his shoes were so beautiful yet hurt the foot, so he proceeded to study anatomy at the University of Southern California. After spending thirteen years in the United States, Ferragamo returned to Italy on the Roma in 1927, this time settling in Florence, where he began to fashion shoes for the wealthiest and most influential women of the century with a workshop of Florentine shoemakers. 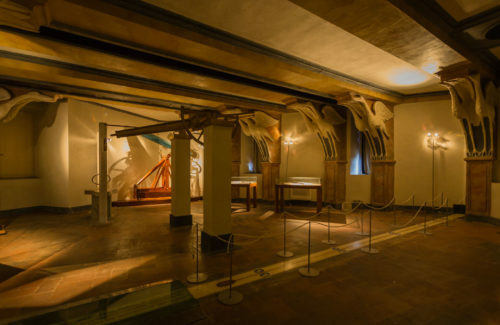 The exhibition fills eight rooms that recall the inside of the ship, where visitors can learn of Salvatore’s influences in artwork by Giovanni Colacicchi, Mino Maccari, Alberto Martini, Thayaht, Giò Ponti, Rosai, Balla and Fortunato Depero, as well as various pieces from Florentine ceramic manufacturer Richard-Ginori. As always, a film was created especially for the show. The exhibition, as described by the curator, “explores the various elements of Italy’s 20th century visual culture, taking from it the themes and works of art that directly influenced or indirectly informed the poetics of Ferragamo’s creations without overlooking the many cultural and social aspects that characterized the post-WWI period up to the eve of the Fascist regime’s authoritarian rise.” Along with the display of shoes there are the elegant artistic garments of the 20s and 30s and unique designs of printed fabric from the era, as well as finely crafted artistic objects, photographs and advertisements. 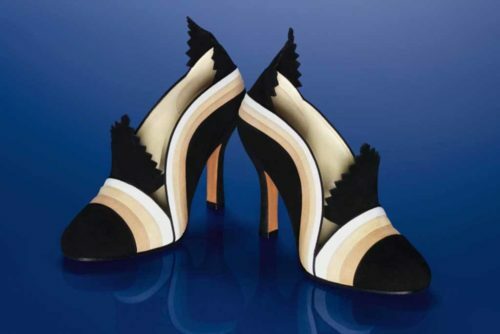 A new Salvatore Ferragamo Creations 1927 Capsule Collection was launched in conjunction with the opening of the new exhibition 1927 The Return to Italy at the Museo Salvatore Ferragamo. The six-piece capsule collection, $1,090 to $2,900, reproduces original Salvatore Ferragamo designs from this period. One of the most famous British legends is that of King Arthur and the sword in the stone, first found in Robert de Boron’s Merlin in the late 12th century. According to the various versions of the story, the sword could only be pulled out of the stone by the true king of England. A similar, much less well-known, story of an earlier date, can be found originating from the Italian region of Tuscany. It has been suggested by some that the Italian tale was inspiration for the British legend. 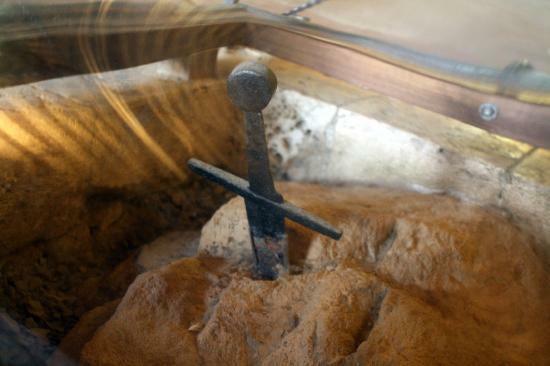 This is the sword in the stone of San Galgano. Galgano Guidotti was born in 1148 in the small town of Chiusdino, Italy in the province of Siena. This strong blond boy reportedly wanted to be a knight and save the maiden. But though he became a knight, trained in the art of war, he was said to be arrogant and vicious and rather than saving the maiden, he broke many a heart. His mother Dionisia stepped in and found him a fiancée. But still he terrorized the region. One day, Archangel Michael appeared to him, showed him the way to salvation in Montesiepi, an uninhabited ridge, near his hometown. The next day Sir Galgano announced that he was going to become a hermit and took up residence in a cave. He was reportedly ridiculed by friends and relatives for his choice. They thought he had gone mad. His mother asked him to get rid of the ragged clothes, dress as befitted his station and, at least, go and say goodbye to his fiancée, perhaps thinking he would change his mind once he had seen the maiden again. Being an obedient Italian son, he complied. Along the way, his horse threw him and Archangel Michael stepped in again and raised him up, directing his feet back to Montesiepi. The archangel directed his gaze to the top of the hill where he saw a vision of a round temple with Jesus and Mary surrounded by the Apostles; then the angel told him to climb the hill and the vision faded. When he reached the top, Archangel Michael bade him to renounce worldly pleasures. Galgano stated that giving up his riches and his fiancée would be as hard as splitting a rock, illustrating his point by attempting to plunge his sword into a large stone. The sword reported slid through the solid rock, where it remains today in the Rotonda di Montesiepi. Another version of the story is that Galgano was convinced that his vision deserved a symbolic act; he decided to plant a cross. Since he had no way to make one of wood, he planted his sword in the ground. The earth solidified into stone and the sword could not be removed. Galgano never left the hill again. Locals and visitors said that he lived in poverty, accompanied by wild animals, as well as the local farmers, who came to talk and ask his blessing. 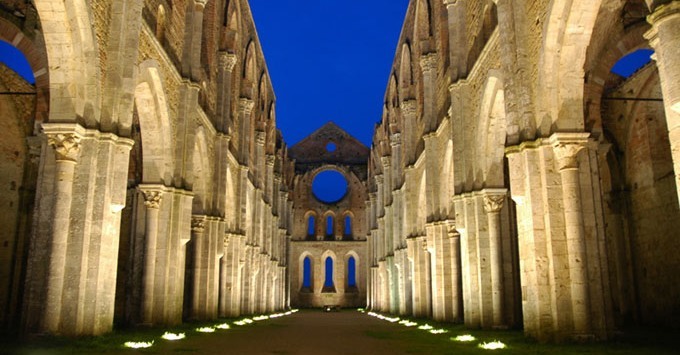 Others came to be followers of Galgano as religious monks. One day an assassin, disguised as a monk (some say he was sent by the Devil) came to kill Galgano; the wolves that lived with Galgano killed the man and gnawed at his bones. We know this because the bones of the murderous soul lie in a reliquary near the tomb of Galgano. One year later, after the attempted killing, Galgano the Religious Hermit died (1181). The funeral was reportedly attended by bishops and three Cistercian abbots. The next year the Bishop of Volterra gave Montesiepi to the Cistercian monks to build a shrine to Galgano’s memory. They began building in 1185, erecting a beautifully unique round temple (Rotonda di Montesiepi) over the purported tomb (also where Galgano’s hermit’s hut was located) and where the sword remained in the stone. (Most of Galgano’s monkish followers in life left, scattered over Tuscany, becoming Augustinian hermits.) The Rotonda di Montesiepi can be visited today. San Galgano is reported to be the first saint whose canonization was conducted through a formal process by the Catholic Church. Consequently, much of San Galgano’s life is known through the documents of his canonization, which was carried out in 1185, just a few years after his death. Nineteen miracles were recorded as part of the canonization process. After Galgano’s death his scalp reportedly continued to grow blond curls to the amazement of the faithful. The miraculous head was placed in a reliquary in a side chapel, and the chewed bones of the arms of the assassin in another. 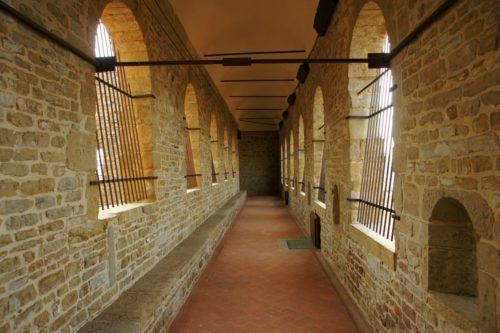 The crowds of pilgrims who came, hoping for more miracles or to be healed of some malady, were so numerous that the Cistercians were authorized to build another monastery, named after San Galgano, a short distance away. By 1220 a large Cistercian abbey was built below Galgano’s hermitage. This sect claimed him as a Cistercian saint. It was one of the most beautiful Gothic buildings of Italy. 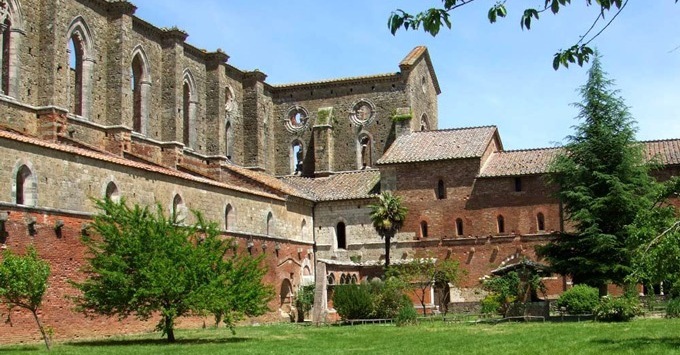 The monastery became powerful, with monks from San Galgano appointed to high offices throughout Tuscany, becoming absentee caretakers of the monastery and temple. The Abbey knew 100 years of great prosperity until 1364, then followed a slow decline. Eventually a local lord removed and sold the lead supporting the roofs of both the round temple and the abbey in 1548. The temple roof survived, but the roof of the abbey collapsed. When a local noble stopped to visit a century later, he found grass in the nave, and just one monk, dressed in rags. The Pope suppressed the abbey in the early 1700s and declared the round temple to be a parish church. 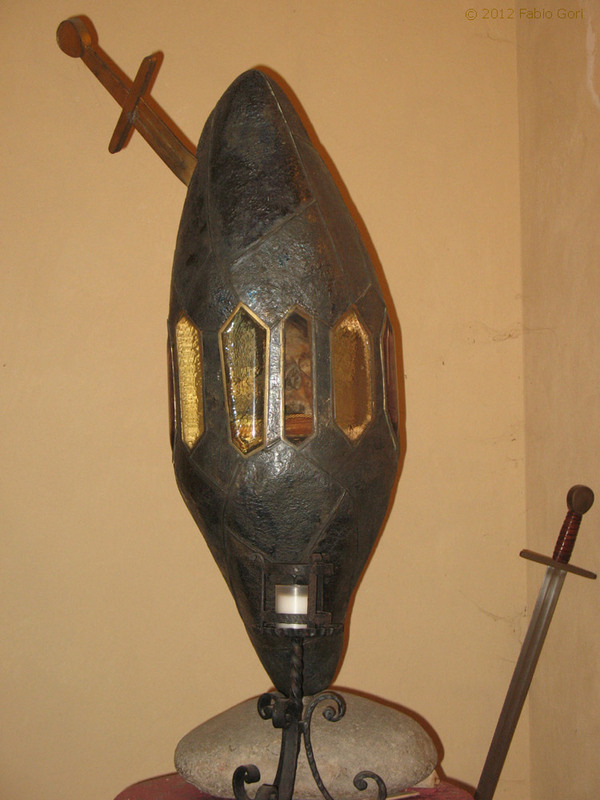 The round chapel still stands, containing both the sword in the stone and the gnawed forearms of the would be assassin. The walls of the abbey are also still standing, and it is a hauntingly beautiful place at all hours of the day. For centuries, the sword in the stone was commonly believed to be a modern fake. Relatively recent research, however, has shown that the sword is indeed from the 12th century, based on the composition of the metal and the style of the sword. The researchers also discovered, with the aid of ground-penetrating radar, that there is a cavity measuring two meters by one meter beneath the sword, perhaps containing the body of San Galgano. 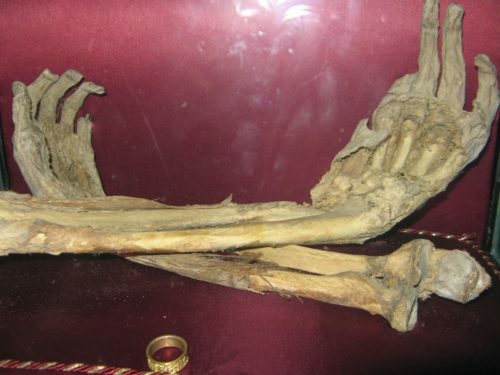 Lastly, carbon dating of the other curiosity of the chapel – a pair of desiccated arms and hands, confirmed that they are also from the 12th century. But Cristina goes on to inform us that the skull of San Galgano is now contained in a reliquary in the San Michele church (Prepositura di San Michele Arcangelo) in Chiusdino. This evocative reliquary was created in 1977 by goldsmith Bino Bini. The modern reliquary is made in embossed silver designed to recall the rock into which the saint thrusted his sword. 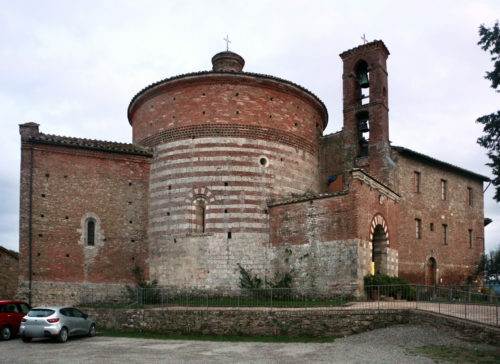 Cristina adds another touring note: There is a chapel attached to the Rotonda di Montesiepi with frescoes by Ambrogio Lorenzetti, painted in 1340 with scenes from San Galgano’s life. Lorenzetti was one one the greatest Sienese masters of Medieval art, the one responsible for the world famous Allegory of Good and Bad Government. The San Galgano frescoes were detached last year and moved to the Museum of the Santa Maria della Scala Hospital in Siena, across from the Duomo, where they are now being restored by the famed restauratore Massimo Gavazzi. Find Cristina Amberti on Facebook and at SienaTours. Tuscan Traveler recommends that you take a tour with her to understand Siena and its history to the fullest. I’ve never been a fan of meatloaf. That is until I lived in Italy and tasted the Italian version – polpettone. It was there, also, that I learned that the meatloaf I disliked had its genesis in Rome. Like most Americans who grew up in the fifties and sixties, meatloaf made an appearance on our dinner table on a regular basis. Meatloaf is a dish of ground meat mixed with other ingredients, formed into a loaf shape, then baked. The loaf shape is usually formed by cooking it in a loaf pan, thus the name. Meatloaf is usually made from ground beef, although lamb, pork, veal, venison, poultry and seafood are also used. The first known recipe came from Apicius, a collection of Roman recipes, usually thought to have been compiled in the late 4th or early 5th century AD. 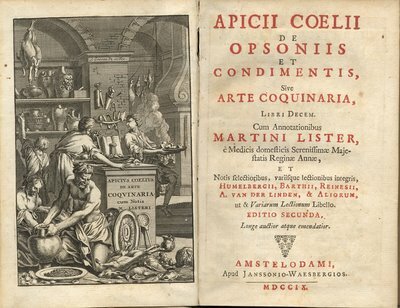 This was the cookbook erroneously attributed to the culinary writings of Marcus Apicius, noble and erudite Roman gourmet of the time of Tiberius. Apicius is said to have derived his gastronomic learning from Greek manuscripts and to have founded a school devoted to the culinary arts. His own manuscript was in fact lost, and the work, which was printed under his name, was derived from notes supposed to have been written by one of his pupils; these notes were copied, apparently, two hundred years after the death of Marcus Apicius. Throughout the Roman Empire the recipe traveled until there were German, Scandinavian and Belgian versions, including the Dutch meatball. American meatloaf has its origins in scrapple, a mixture of ground pork and cornmeal served by German-Americans in Pennsylvania since Colonial times. However, meatloaf in the modern American sense of a loaf of ground meat did not appear in cookbooks until the late 19th century. 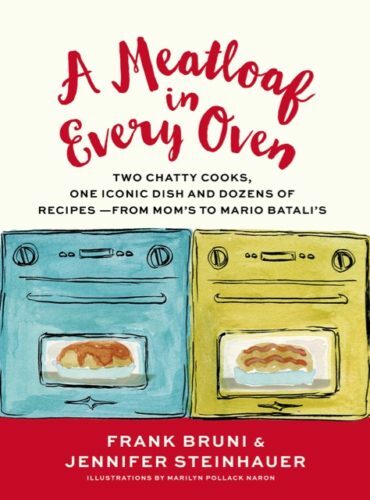 Recently, Frank Bruni and Jennifer Steinhauer, both contributors to the NY Times, shared their passion for meatloaf, having been exchanging recipes via phone, email, and text message for decades, in a new book, A MEATLOAF IN EVERY OVEN. 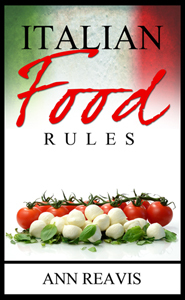 It is their homage to a distinct tradition, with 50 recipes from Italian polpettone to Middle Eastern kibbe to curried bobotie; from the authors’ own favorites to those of famous chefs and prominent politicians. The new U.S. president has brought a love of meatloaf to the White House and a few months back forced Governor Chris Christie to partake of his favorite dish. The name polpettone is derived from polpette, which are Italian meatballs. 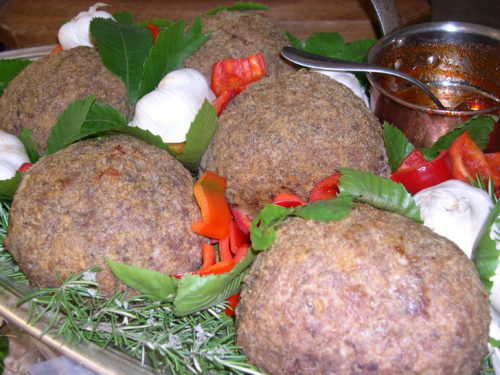 Polpettine are tiny meatballs and polpettone is a large or giant meat ball (large enough to share). One of my favorite cookbook writers is Pellegrino Artusi, author of the famous Italian cookbook La Scienza in Cucina e l’Arte di Mangiare Bene (The Science of Cooking and the Art of Eating Well). Writing 100 years ago, Artusi is the father of Italian cuisine. Luckily for me, his seminal book has been translated into English. Artusi riffs on “Mr. 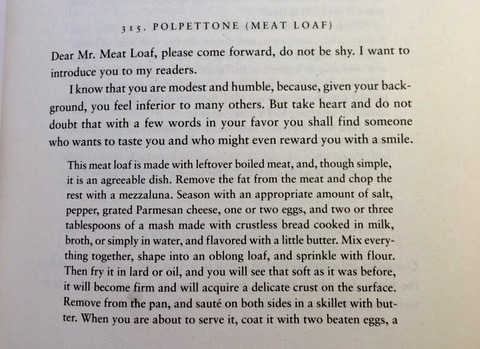 Meatloaf” who is “shy” and “feel[s] inferior” to other dishes. To Artusi and many Italians, polpettone is a way to use left-over meat and stale bread to create a delicious meal for the family. Artusi, like Lidia Bastianich, soaked stale bread in milk (see Lidia’s video), which perhaps is one answer to improving the dry meatloaf of my youth. Artusi cooked his giant meatball in a pan on top of the stove creating a crispy crust surrounding a juicy center. He made an eggy cream sauce to pour over the finished meatloaf, an improvement on the catsup of today. 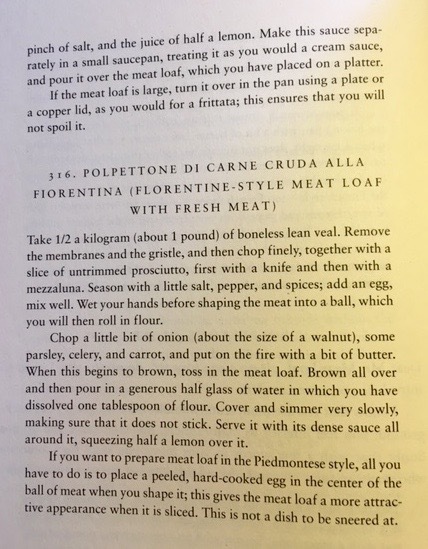 Artusi also offered a recipe for a stuffed meatloaf alla Piedmontese with hardboiled eggs at the center to give the meatloaf “a more attractive appearance when it is sliced.” Mario Batali’s home-style Italian polpettone ripieno wraps a 50/50 ratio of ground beef to sweet or spicy Italian sausage around vegetables, which keep the meat moist and adds much-needed flavor to the traditional dish. Notice, a loaf pan is not used in Batali’s recipe. Dario Cecchini, the famed butcher of Panzano serves a polpettone, known as Il Cosimino, (find “Il Cosimino” in the artistic photograph on his home page) in his restaurants and sells it in his macelleria (butcher shop). Dario’s polpettone is a hand-formed, oven-baked beef meatloaf with a small amount of lean pork, garlic, red onion, thyme, salt and pepper. The name is derived from a dish that was served for the first time at a banquet for Cosimo de’ Medici’s christening in 1519, it brought him great luck for this baby from the more obscure branch of the Medici clan became the first Grand Duke of Tuscany. Il Cosimino can be sliced or cubed. I like it best with a spicy-sweet Mediterranean sauce made of bell pepper and peperoncino. I can’t wait to be back in Panzano to have Cosimino again. 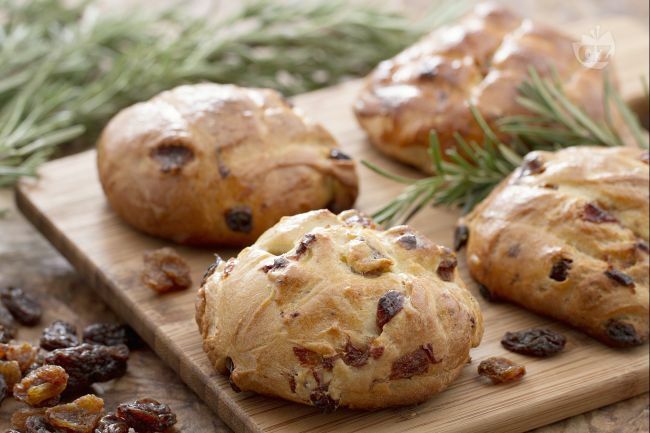 Pan di Ramerino is a Florentine Easter tradition, large chewy rolls flavored with rosemary and raisins. In the past and still today, they were made for Giovedi’ Santo, Maundy Thursday (the day before Good Friday), marked with the Cross, and sold by street vendors outside the churches (often blessed by the priest) and in bakeries throughout Tuscany. It is the perfect combination of sweet and savory. Rosemary in Tuscan dialect is Ramerino. Florentine rosemary bread was born in the Middle Ages. It is a devotional product and each of its ﬂavors is tied to a symbolic signiﬁcance. It is an emblem of the immortality of the soul and during the Middle Ages it was thought that rosemary kept away evil spirits. Grapes (raisins), olive oil and grain are metaphors of life and represent Holy Communion. In addition, the bread is cross cut (a hot-crossed bun), which favors leavening, and gives the image of the connection between religion and the bread. 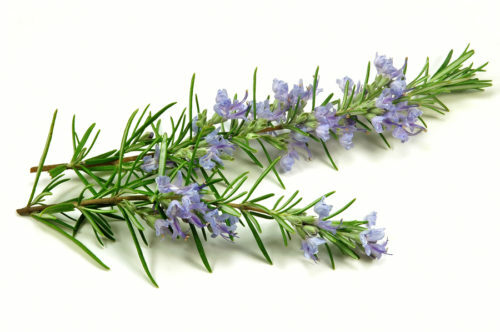 Rosemary, a plant which abundantly grows in Tuscany, results in the designation ramerino (Tuscan dialect for rosmarino). It is also known as panino con lo zibibbo, which refers to the type of grape used in the ancient recipe. 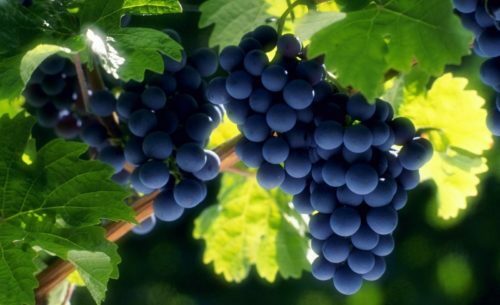 A local grape, zibibbo, with seeds was used in the past and now it is more common to use seedless grapes. A more modern version has a shiny, sticky sweet sugar syrup top. The recipe includes: soft wheat flour, water, yeast, salt, olive oil, raisins and rosemary (the rosemary is roughly ground in a mortar, passed through a sieve, sautéed in oil) and made into the dough. It is divided into pieces which are left to rise under a damp cotton cloth. Before being put in the oven, the rolls are brushed with oil or a egg wash. Baking traditionally takes place in a wood-burning oven. The sugar syrup is brushed on when the cooked buns are still warm. Production is widespread throughout Tuscany, especially in Florence, where there are more than 100 bakeries. The quantity produced is about 120-140 tons per year; demand and production in recent years are more or less stable. Sales are exclusively local, 80% directly to the public and 20% to local shops. Recipes can be found here and here. Video is here, here and here. 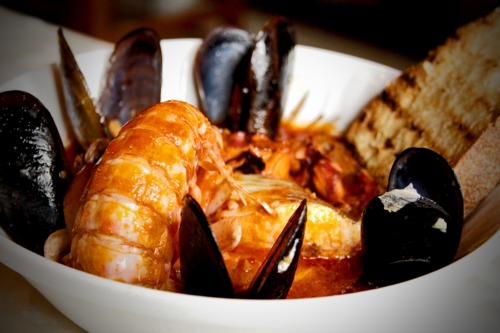 Cacciucco is a hearty Italian fish stew known to the western coastal towns of Tuscany and Liguria for over 500 years. It is especially associated with the Tuscan port city of Livorno and the town of Viareggio to the north. The term ‘Cacciucco’ derives from a Turkish word Kϋçϋk (“small” or “bits and pieces” or “odds and ends”), which refers to the size and variety of the fish used to make the dish. Originally, Cacciucco was made with those fish left over after a catch, the pesce povero or “poor fish” because they were more difficult to sell and often taken home at the end of the day by the fisherman for his family. 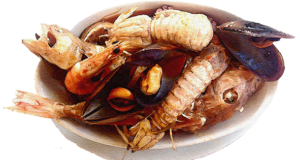 It is a stew or soup consisting of several different types of fish and shellfish. According to one tradition, there should be five different types of fish in the soup, one for each letter C in Cacciucco. A wide variety of Mediterranean fish and shellfish may be used, such as octopus, squid, and bony fish like scorfano nero (black scorpion fish), pesce prete (Atlantic stargazer), gallinella (tub gurnard), palombo (dog fish), and tracina (weever fish), small clams (littleneck or manila), mussels, shrimp, calamari, mantis prawns crabs, eel, cuttlefish, octopus, bream, mullet, or anything else caught that day. The soup is made with tomato, garlic, chili, red wine and often fresh sage. 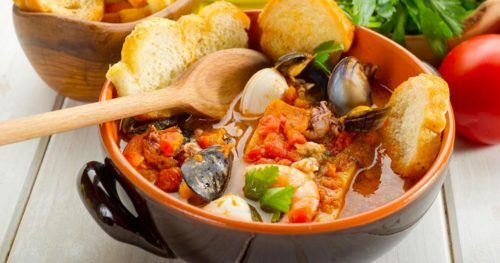 Cacciucco is similar to other types of fish stew, such as the French bouillabaisse, Greek kakavia, Spanish zarzuela, and Portuguese caldeirada. Cioppino, another fish stew, was created by Italian-American fisherman in San Francisco, who used the local Dungeness crab in a variation of the Cacciucco recipe. There are many legends and myths surrounding its creation although there are two stories most often repeated. The first tells of a fisherman from Livorno who lost his life at sea in a shipwreck. His children were so hungry with nobody to provide for them after his death that they turned to all their neighbors for food. 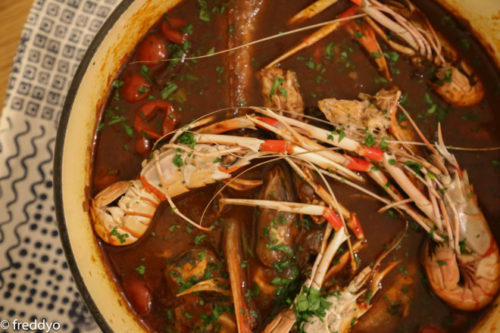 Everyone gave them different types of fish (similar to the story of Acquacotta), with which their mother made a huge soup adding tomatoes, garlic, oil and slices of bread – thus creating the first cacciucco. The second, is that a lighthouse keeper created the soup. The Florentine Republic had prohibited the use of the olive oil that he always used to fry his fish and so instead of his favorite pesci fritti, he made a fish soup instead. For 700 grams (1 1⁄2 lb) of fish, finely chop an onion and sauté it with oil, parsley, and two whole cloves of garlic. The moment the onion starts to brown, add 300 grams (10 1⁄2 ounces) of chopped from tomatoes or tomato paste, and season with salt and pepper. Other recipes can be found here, here, and here.